Cambados, acknowledged as the Albariño wine capital, is a real open-air museum carved in granite. The town boasts one of the best-conserved historical complexes in Galicia, due to the large number of stately homes, noble streets, monuments, sculptures… Cambados was created from the merging of three historical cities that retain their authenticity: Fefiñáns with a distinctly noble character, Cambados with its beautiful squares, streets and ruins of Santa Mariña, and the eminently seaside character of San Tomé. The joining of these towns makes Cambados a unique place in Galicia..
O Grove, under the slogan “Paraíso do Marisco” (Seafood Paradise), contains a range of resources that make this peninsula unique. A seaside town where everything in this piece of Atlantic land tastes and smells of the sea. The Seafood Festival is a real example of this symbiosis between the sea and the land. You will discover its spa town, which is a true reflection of the power of A Illa da Toxa hot springs and the town’s spa tradition. O Grove a natural enclave, Landscape, Nature, Hiking, Viewpoints… and the Estuaries. In the early twentieth century, Sanxenxo began to stand out for its natural qualities as a popular summer resort for politicians and other high-profile social personalities, becoming one of the main tourist destinations in Galicia. Its beaches, waters and daytime and nighttime attractions enhance the highest level of tourism. This city was declared a World Heritage Site by UNESCO due to its multicultural nature and for being the final destination of an ancient pilgrimage route: St. James’ Way, which, since the ninth century, has transformed this finis terrae into a meeting point for faith and thinking of the Western world. The discovery of the tomb of St. James in the early ninth century turned it into a place of worship. 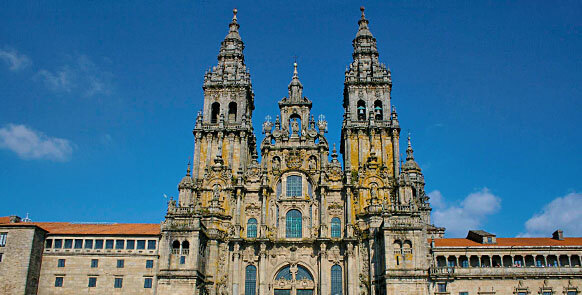 Since then, pilgrims from across Europe have set off on foot towards Santiago. It was there that the cathedral was built, a monumental image of the city made of granite from its monasteries, its pilgrims’ hospitals, numerous churches, stately homes and the squares in which time has stood still. Outstanding Festivals of the Apostle, declared of International Tourist Interest. You can enjoy its cuisine, which is capable of satisfying all tastes and pockets. LAND: mountain biking, Meis Golf, mountaineering, routes on horseback, gastronomic routes, hiking – trekking, tennis, paddle tennis, wine tourism..
WATER: scuba diving, canoeing, boat trips. WORKSHOPS: fauna and flora watching.